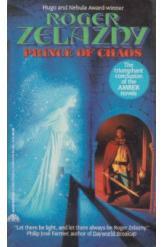 Prince of Chaos by Roger Zelazny Sci Fi. Book in a very good condition, all pages intact. Having survived betrayal and attempted assassination Merlin discovers he is third in line to occupy the throne of chaos. This book is the triumphant conclusion of the Amber novels.